The Stafford bath pillar taps from Burlington features a traditional design, manufactured to the highest standards using the latest technology. Create the perfect period bathroom with our range of quality chrome plated deck mounted traditional taps. Comes with a 10 year guarantee. 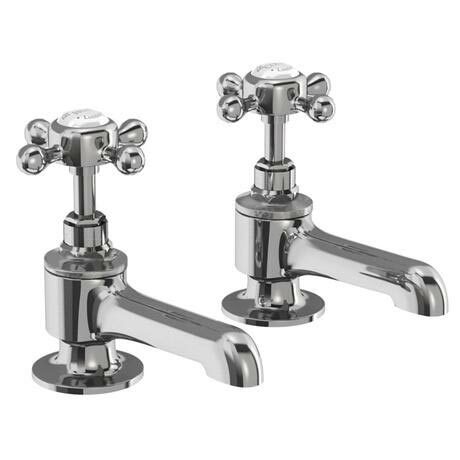 Create a timelessly traditional style in your bathroom with a pair of Stafford pillar taps from Burlington. Renowned for delivering excellence in both build and craft, Burlington are at the top end of luxury items in the bathroom, particularly with traditional products. The taps have a brass interior making them robust and durable in order to withstand the daily uses of the bathroom and have been finished in polished chrome for a touch of style.